My '60s art college course included anatomy. Our lecturer was a retired surgeon who wore a green operating gown, for no apparent reason. He drew the body parts with a felt-tipped pen on the naked flesh of life models. One new male model arrived in a pair of shorts, the sort worn by boxers, with an elasticated waistband and shiny fabric. It hid a substantial part of his body from above the waist to mid-thigh. When our lecturer wanted to talk about the gluteus maximus he hooked a finger around the model's waistband and hoicked it down, around his buttocks. The poor man blushed from the neck up. After the lecture was over, we never saw him again. I enjoyed those lectures. Our lecturer brought pickled body parts in jars to show us. I remember a slice of a human brain. When we were invited to go on a trip to the Hunter collection at the Royal College of Surgeons, I leapt at the chance. I'd already done some pickling myself, preserving stuff with formaldehyde, which stank. My poor flatmate didn't complain. 'Narrative Remains' is a collaboration between artist and writer Karen Ingham and the Hunterian Museum. This film accompanied a site-specific installation at the Hunterian, which contains a large number of 'wet specimens', preserved elements of human anatomy, collected by the anatomist John Hunter. Ingham's work brings the dead back to life through their displayed organs, giving the patients a voice and a narrative that connects to the preserved specimen. One such is the throat of Marianne Harland, a musically talented young woman who lost first her famed voice, and then her life, to tuberculosis. I used to have a copy of a paperback book by Garet Rogers called 'Brother Surgeons', about John Hunter and his brother William, who revolutionised surgery in the 18th century. I wish I knew what's happened to the book, which is now out of print. Copies fetch between £50 and £70. I remember reading about the 18th century "treatment" for syphilis, which was mercury; a highly toxic substance. They used to say, "After Venus comes Mercury". 18th century surgeons obtained cadavers from the so-called "resurrectionists" or body-snatchers. It wasn't until 1832 that the Anatomy Act outlawed the practice. Nowadays the medical schools obtain cadavers through bequests, such as the one I've planned. Click here to find out how. 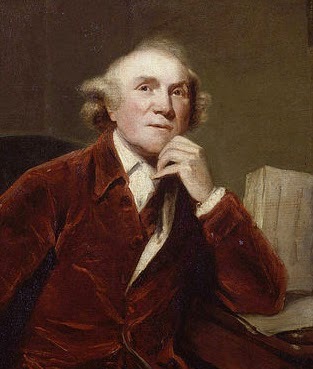 Portrait of John Hunter (13 Feb 1728 - 16 Oct 1793) by John Jackson.